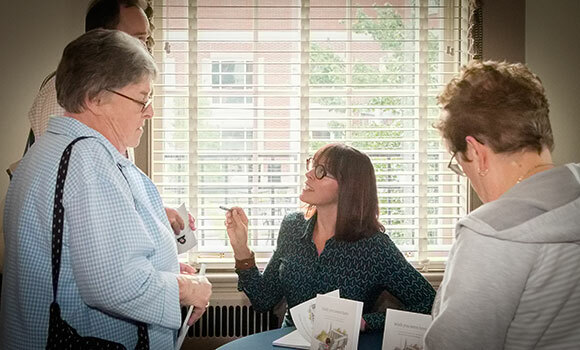 Elizabeth Hudson signs copies of her book, "Wish You Were Here," in UNCG's Alumni House. There’s a yellowed piece of paper with a jagged edge pinned above Elizabeth Hudson’s desk at Our State magazine. On it, there’s a list penned in tight cursive of nine definitive characteristics of Southern fiction: deep involvement in place, family bonds, celebration of eccentricity, strong narrative voice, themes of human endurance, local tradition, sense of impending loss, pervasive sense of humor in the face of tragedy and an inability to leave the past behind. Hudson jotted down those words as an undergraduate student at The University of North Carolina at Greensboro in Charles Davis’ Southern Fiction class. Now, she uses those characteristics as a guide to build each issue of Our State magazine. “This is exactly how I make a magazine every month,” Hudson told the group that gathered Wednesday at the Friends of the UNCG Libraries event. Hudson began her career at Our State 18 years ago, but her journey there began long before. As a child, Hudson was an avid reader, devouring any book she could get her hands on. After high school, Hudson went to Appalachian State University before she dropped out in the middle of her freshman year. When she returned home to the small town of Farmer, she got a job driving the tram around the North Carolina zoo. Before long, however, Hudson decided to return to her studies. She attended Randolph Community College for several semesters and then transferred to UNCG. “I didn’t know what I wanted to do,” she said, but adds that she did know that she wanted to read. “I started signing up for English classes,” Hudson said. But she didn’t stick to classes just in the English department. “This is the kind of school that lets you explore with a lot of things,” she said. Hudson said she “dabbled” in a number of subjects, including geography and film. In the geography classes, she developed a “sense of place,” and the film courses strengthened her storytelling skills. “Everything that happened here somehow stayed with me,” she said. After graduation, Hudson worked in a bookstore. On a particularly slow business day during the summer, she picked up a copy of Our State magazine to read in hopes of making her shift on the cash register go by more quickly. The editor’s note in that particular issue was about working for Our State magazine. Hudson was intrigued, and she called to see if they had any openings. Because of her retail experience, she was offered a job answering phones. Hudson would take customer calls, handling everything from subscriptions to complaints to story ideas. In between calls, she would read over magazine stories. As the publication began to grow, Hudson took on more responsibilities, and she rose through the editorial ranks. “I’ve had every editorial role that exists in publishing,” she said, explaining that she became an editorial assistant before moving up to associate editor and now to editor-in-chief, a position she’s held for six years. Since Hudson began in 1997, Our State magazine has grown from 40,000 to 178,000 subscribers. “This magazine is really unique,” she said, pointing to the high quality writing and photography featured each month. Hudson said she believes her English degree from UNCG and literary background have contributed to that, giving her an eye for truly amazing stories. Even though she’s been reading and writing stories about the Old North State for the last 18 years, Hudson said the stories keep coming.